50 plant refers to the HZS50 concrete mixing plant,equipped with twin horizontal shafts compulsory mixer and twin motors, HZS50 concrete batching plant is powerful in mixing various aggregates, usually used for small and medium sized commercial concrete production. 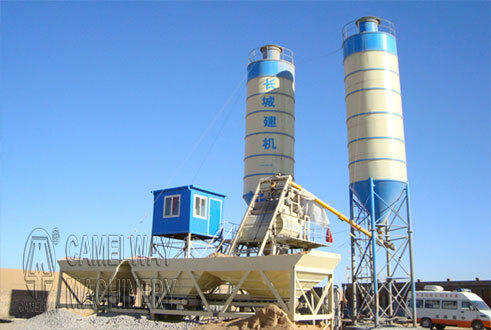 The rural market demand for concrete is growing with the launching of new rural construction, many investors have been attracted to invest commercial concrete batching plant. Equipment performance and price has get large attention. HZS50 concrete mixing plant is a kind of small concrete batching plant, using compulsory twin-shaft mixer and PLD concrete batching machine, with automatic control, accurate weighing, etc., to produce plastic, dry hard concrete, with reliable quality. Compulsory mixer with a short mixing time, fast unloading, uniform mixing results, high productivity, is used to mix dry hard, plastic and various proportions of concrete well. And it has a dedicated control room, providing a quiet and comfortable working environment for the operator.